A typical day at the ISUtrecht could be filled with lessons, excursions, workshops or celebrations. We will tell you all about it below. You might also be interested in watching a short film in which two students take you along as they go through their day at the ISUtrecht. As a Dutch International School we encourage our students and parents to travel to school by bike – just like the locals. 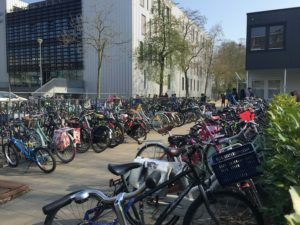 Utrecht was recently choses as the second most bicycle friendly city in the world (after Copenhagen). The ISUtrecht GoByBike team has made a handy guide to help you on your way! The school can also easily be reached by public transport as both the bus and the ‘sneltram’ stop close by. Utrecht also has really good train connections to cities such as Hilversum, Amsterdam or Amersfoort. At ISUtrecht we like to celebrate together, involving the whole school community. The ISUtrecht Artburst for instance showcases visual arts as well as performances by various members of the school community (students, teachers and staff). 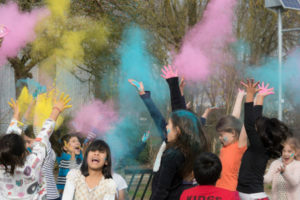 Typical Dutch festivals like King’s Day and Sinterklaas as well as festivals like Holi or Halloween are celebrated with a host of different activities. Other highlights in the ISUtrecht school year are the ISU drama troupe musical, the DP Arts Exhibition and Personal Project presentation. The doors to the main campus open at 8:20. Our youngest students are being brought in by their parents, using the external doors in the kindergarten classrooms. The kindergarten students hang up their jackets, put their lunch boxes and water bottles away and change their outdoor for their indoor shoes. Older primary students make their way over to their classrooms themselves and quickly settle in, ready for their first lesson, which starts at 8:30. 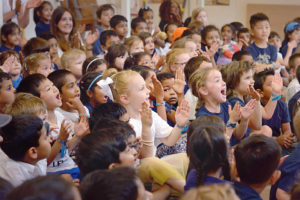 Besides spending time with their classroom teacher, primary students also get Dutch, music, visual arts, drama and gym lessons from specialist teachers. Classroom teachers will regularly take their students on an excursion to a museum, factory or exhibition, either in Utrecht, or a bit further a field. These excursions tie in with the Unit of Inquiry that students are working on. For more information, please read the Field Trip Protocol. Grade 5 students go on a three day overnight trip in the Netherlands at the start of the school year. 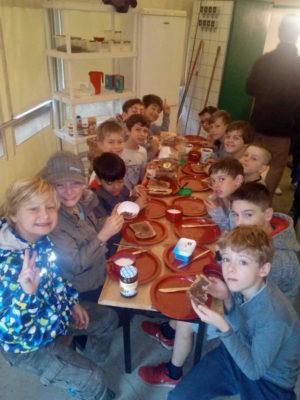 In October 2018 the grade 5’s went to on a camping trip to Tipikamp Ossendrecht. Primary students have a shorter break in the morning, where they go outside onto either the early years adventure playground or the primary playground to the side of the school. The students in kindergarten – grade 5 all eat their packed lunch inside the classroom, before they go out again for a longer break just after lunch. Secondary students are being taught in the main campus, as well as the nearby secondary annex at the Grebbeberglaan. During the school day, they move around and between buildings to attend lessons. Students in grades10-12 have their own student lounge at the main campus. A typical day for secondary students might involve self study time, assembly, excursion, a mentor lesson or Service as Action. Students have a morning and lunch break and might have free periods during the day meant for self study. Students bring their own packed lunch, however both the secondary annex and the study lounge at the campus have kitchen facilities where students can heat up their food. At the start of every school year the students in grades 6-10 go on a residential trip. In October 2018 the students visited: Terschelling, the Ardennes, Heino, Maastricht and Paris. These trips not only provide the students with the opportunity to learn in a different context, but also give them the chance to bond and spend time with each other outside of school. Our Diploma Programme students carry out practical work for one of the sciences during the DP Experience Week.